Three weeks out of a brace, James Aish is moving closer to a return from the knee injury that threatened to derail his season. 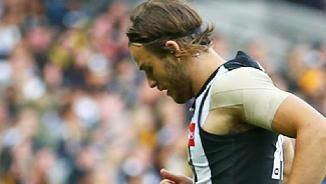 Two key Magpies have made significant progress in their rehabilitation from long-term injuries. Collingwood’s come-from-behind win over Hawthorn came at a cost for wingman James Aish, who will miss at least the next fortnight with a broken cheekbone. A silky-skilled midfielder, Aish was drafted to the Brisbane Lions with pick No. 7 in the 2013 National Draft. He was a prodigious talent as a junior renowned for making good decisions and using the ball well. Aish seamlessly slotted into the Brisbane midfield in his first year at the club, playing 21 senior games. This number was cut back to just 11 in 2015 before the South Australian opted to request a trade to Collingwood. Aish played 15 games during his first season in the Black and White, warming to the task as the season wore on. His 28 disposals and seven inside 50s against eventual premiers the Western Bulldogs underlined what he was capable of, but injuries and opportunities meant he was seen only eight times in 2017. After making significant gains late in 2016, Aish struggled to find his best form for much of 2017. Injuries played a significant part, and it was only until the final weeks of the year that he was able to play three home and away games in a row. His VFL form remained strong throughout, highlighted by his 28-disposal performance against Geelong midway through the year. Sadly, concussion and a cheekbone fracture interrupted his momentum at key moments. A flashpoint arrived against Hawthorn in round nine, when he bravely put his body on the line against Daniel Howe on the southern wing. Aish damaged his cheekbone and was left wearing a helmet in the weeks that followed. 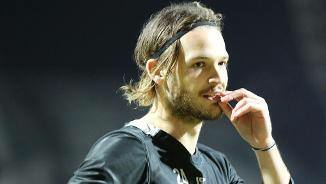 But although it sidelined him for a further fortnight, the act earned further respect from his teammates, and played a key role in turning the result in Collingwood’s favour. Fresh faced and stepping into the AFL spotlight in Melbourne, James Aish successfully completed his transition year from Brisbane with strong late-season form. However while fellow trade-targets Adam Treloar and Jeremy Howe made immediate impacts with their new team, Aish was made to earn his place. The pathway to senior success challenging. In March, the South Australian played in both a NAB Challenge clash with the Western Bulldogs and a VFL practice match at the Holden Centre in the same day. The reward came just a week after a disappointing round one loss with Aish making his Collingwood debut against Richmond at the MCG. He had 14 disposals in his first ANZAC Day showing in round five, yet lost his spot in the team for the following match against West Coast in Perth. Three more games in the VFL followed in the middle stages of the season, however the classy wingman was quick to adapt to his new surroundings. Aish averaged 26 disposals in his four games with the VFL Magpies, with 34 touches on a wet day at Casey Fields cementing his place back in the seniors. Here he stayed for the remainder of the season. 18 disposals and two goals against Richmond saw the 20-year-old collect his first career Brownlow vote in round 20, while a career-high 28 possessions came a week later in a narrow loss to the Western Bulldogs. While the beginning of the settling process was bumpy, Aish won over coaches, teammates and supporters alike with his impressive late-season form. The teenager bore the weight of expectation on his shoulders after an eye-catching debut season in 2014. Though he enjoyed some bright moments, Aish could only manage 11 games, with a finger injury ending his campaign in round 17. After a year of flux, Aish found himself in the spotlight when he requested a trade to Collingwood. He was forced to wait until the final day of the trade period before the deal was sealed. 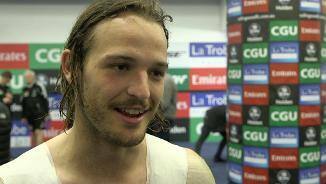 The classy South Australian midfielder has a standout first season. Aish played 21 games and showed he could not only use the ball well in space, but became increasingly proficient at winning it in congestion. The Lions are desperate to sign him to long-term deal as the 19-year-old is a key pillar of their future on-ball brigade. The classy wing / midfielder comes from Norwood royalty, with his dad Andrew a Redlegs midfielder, uncle Michael the 1981 Magarey medallist and grandfather Peter a former captain. Aish has already helped Norwood to two SANFL premierships and was named in the under-18 All-Australian team in 2012 and 2013. He is good in traffic, efficient on both sides of his body and is a readymade AFL player capable of making an impact in his first season. 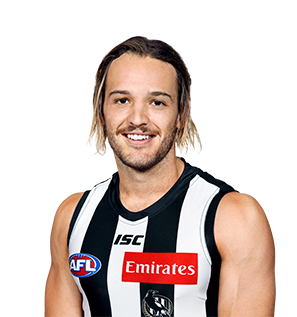 Traded by Brisbane to Collingwood in October 2015 as part of a three-club trade involving North Melbourne. Collingwood sent pick No. 26 and a future second round draft pick to Brisbane in exchange for Aish, while receiving picks No. 34 and No. 53 from North Melbourne in exchange for picks No. 28 and No. 47.